BMO’s residential mortgage portfolio rose to $108.5 billion in Q1 from $106.4 billion a year earlier. The HELOC portfolio—55% of which is amortizing—stands at $31.7 billion, unchanged from the previous quarter. Mortgage growth through proprietary channels, including amortizing HELOCs, was up just 3%. 44% of BMO’s residential mortgage portfolio is insured, down from 50% a year ago. The loan-to-value on the uninsured portfolio is 54%, unchanged from a year ago. 69% of the portfolio has an effective remaining amortization of 25 years or less, up from 68% a year ago. The 90-day delinquency rate was 21 bps, up from 20 bps in Q1 2018. “While the financial markets have been more volatile this quarter, underlying economic conditions were stable and the performance of our credit portfolios remain strong,” said Patrick Cronin, Chief Risk Officer. 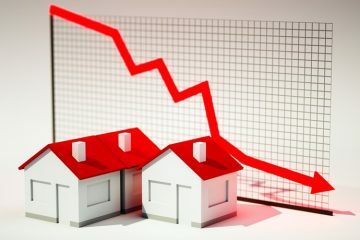 CIBC’s residential mortgage portfolio fell to $201 billion in Q1, down from $202 billion in Q4 and $203 billion in Q1 2018. Of the portfolio, $27 billion is from the Greater Vancouver Area (down from $28B a year earlier), and $63 billion is from the Greater Toronto Area (unchanged from a year ago). Of the uninsured portfolio, the LTV was 54%, down from 64% a year ago. The bank reported $6 billion in originations in the quarter, down from $9 billion a year ago. The bank’s HELOC portfolio fell to $21.8 billion in the quarter, down from $22.1 billion last quarter but up slightly from $21.6 billion a year earlier. Net interest margin in Q1 was 242 bps, down from 245 bps last quarter but up from 235 bps in Q1 2018. Of the bank’s uninsured residential mortgage portfolio, 0.21% are in arrears by 90+ days, up from 0.19% in Q1 2018. For insured mortgages, the arrears rate is 0.37%, up from 0.34% in Q4 2018 and 0.30% a year ago. “Residential mortgages higher in the insured segment where losses would remain low,” CIBC noted in its investor presentation. About 6% of the bank’s uninsured portfolio has a Beacon score of 650 or less (down from 7% last year). The bank’s residential mortgage and HELOC portfolio rose to $67.9 billion in Q1, up from $65 billion a year ago. The average LTV on the uninsured mortgage portfolio was 60%, while the average LTV on the HELOC portfolio was 58%. Quebec represented 54% of the mortgage book (down from 55% from a year ago), while Ontario made up 26% (unchanged) and Alberta 8% (unchanged). Net interest margin in Q1 fell to 2.22%, down from 2.25% in Q4 and 2.24 in Q1 2018. The bank’s residential mortgage portfolio is 41% insured, down from 44% a year ago. The average LTV of the uninsured mortgage and HELOC portfolio was 60%, up from 58% a year ago. Uninsured mortgages and HELOCs in the GTA and GTV represented 10% (up from 8% in Q1 2018) and 2% (unchanged) of the portfolio, respectively, and have an average LTV of 52% (up from 50% a year ago) and 49% (up from 44%), respectively. 22.7% of the bank’s residential mortgage portfolio has a remaining amortization of 25–30 years (down from 25.5% in Q1 2018). Another 24.5% have a remaining amortization of 0–20 years. The gross impaired loans ratio was 41 bps, down from 43 bps in Q1 and up 1 bp from Q1 2018. RBC’s residential mortgage portfolio rose this quarter to $246 billion, up from $233 billion a year ago. The bank’s HELOC portfolio fell to $39.6 billion, down from $40.5 billion a year ago. 62% of its mortgages are uninsured, up from 56% a year ago. The average LTV on the uninsured portion is 51%, unchanged from a year ago. RBC cited a “strong underlying quality” of its uninsured portfolio. 90+ day delinquencies in the overall residential mortgage portfolio rose to 0.21%, up from 0.20% a year ago. For the uninsured portion, delinquencies were steady at 0.17%. The bank’s uninsured mortgage portfolio has an average FICO score of 796, up from 793 a year ago. The average remaining amortization of RBC’s residential mortgages is 18 years. Condo exposure remains about 10% of the bank’s residential lending portfolio. Net interest margin was 2.79%, up from 2.77% in Q4 and 2.68% in Q1 2018. The total portfolio of residential retail mortgages rose to $216 billion in Q1, up from $208 billion in Q1 2018. The portfolio comprised $188 billion in freehold properties (up from $181 billion a year ago) and $28 billion in condos (up from $27 billion a year ago). Residential mortgages grew 3% year-over-year. 58% of the residential mortgage portfolio was uninsured in Q1, up from 52% in Q1 2018. The average LTV of the uninsured portfolio was 55%, up from 53% in Q1 2018. The bank saw new originations in the quarter amounting to $9.3 billion, down from $10.3 billion a year ago. Meanwhile, the LTV of new originations in the quarter was 64%, up from 63% last quarter. Net interest margin rose to 2.44%, up from 2.41% in Q1 2018, “primarily driven by the impact of prior rate increases,” the bank said. 90+ day delinquencies in the residential mortgage portfolio rose to 0.21%, up from 0.20% a year ago. 56% of the bank’s uninsured portfolio has a FICO score of 788 or greater (down from 57% last quarter). The average score is 787 nationwide, and 789 (down from 790) in the GTA and 791 (up from 790) in the GVA. TD’s residential mortgage portfolio was $193.9 billion in Q1, down from $194.1 in Q4 but up from $190.6 billion in Q1 2018. The bank’s HELOC portfolio rose to $87.1 billion from $76.8 billion a year ago. TD’s residential real estate secured lending portfolio is 66% uninsured (up from 59% a year ago) with a 53% LTV for the uninsured portion (down from 51% in Q1 2018). Gross impaired loans in the residential mortgage portfolio were unchanged year-over-year at 0.14%. 87% of the bank’s RESL portfolio is amortizing (unchanged from Q4) and 60% of its HELOC portfolio is amortizing (up from 59% in Q4). Net interest margin in the bank’s retail portfolio rose to 2.94% in Q1, up from 2.88% a year ago. 51% of the bank’s residential mortgage portfolio is in Ontario, followed by the Prairies at 19%, B.C. at 18%, Quebec at 9% and just 3% in Atlantic Canada. Note: Transcripts are provided by a third party (Seeking Alpha) and their accuracy cannot be 100% assured.